Class D is the most represented class on the list of falls occupying 6 of the 15 spots, while class B has 5 wrestlers on the list. 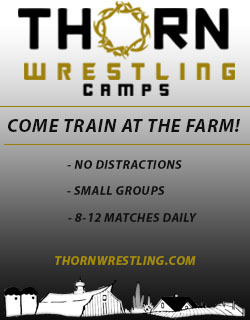 Class A and class B each have 2 wrestlers on the list. Colton Wolfe has an impressive 54-0 record and is riding a 27 pin streak that dates back to January 7th. During that streak, he has pinned the following ranked opponents from Nebraska: A#4 (twice), A#5, B#1 and C#4. His fastest falls have been :08, :10, :11, :11, :11, :18, and :19. He wrestles in 195A and is looking to cap his senior season with a 3rd state title. 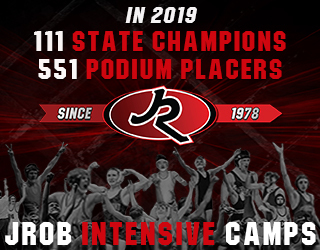 Derek Robb owns a spotless 52-0 record and has earned bonus points in all but one match, which was an 8-3 win over a state finalist from Wyoming while wrestling up at 160. Along with 42 pins, he has 2 technical falls and 3 major decisions. He’s the favorite to win the class B state title at 152. Palmer is ranked 9th in the class D standings, and has 3 wrestlers on this pins list. The Tiger Trio is murderer’s row with Spencer Wichmann at 145, along with brothers Connor Donscheski at 152 and Chandler Donscheski at 160. Class A and class B are most represented on this list, both having with 5 wrestlers. Class C has 3 wrestlers and class D has none. Along with his 17 technical falls, Riley Berg has earned 17 falls and 3 major decisions to give him a 46-0 record. He’s a three-time state placer and two-time state finalist, and is a top contender to bring home the class B state title at 138. Millard South and Wood River each have two wrestlers on the list who are striving for their first state titles. Class A schools occupy 9 of the 21 on the list with class B holding 7 spots. Class C and D each have two on the list. Kylan Byars is currently ranked #4 at 152 in class A. He has amassed a 32-11 record this season and a finished last season with a 37-9 record and was a state qualifier. Fairbury has two wrestlers (Patrick Ondrak and Damian Green) on the list with 8 major decisions. February 14, 2017 in High School.